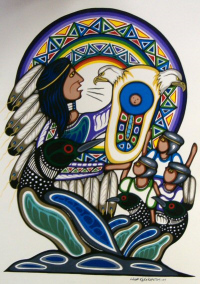 Lloyd Kakepetum is a Cree native artist. Lloyd Kakepetum is a Keewaywin First Nation band member who was born on the Sandy lake Reserve in the far reaches of northern Ontario near the Manitoba border. His work is very much influenced by his uncle, Carl Ray - a founding member of the Indian Group of Seven. His imagery speaks of the traditional stories of the Ojibwa and his intention is to use art to encourage the telling of the tales in order to keep the Anishnabe spirit alive in today's world.